RPG Maker does not come with a way to disable individual choices from a list of choices. For example, if the player shouldn’t be allowed to select a particular option, but you still want to show it, there’s basically no way to do it. This plugin provides an easy way for you to disable each choice based on your own custom conditions using tools that you are already familiar with! Download the plugin and place it in the “plugins” folder in your project’s “js” folder. 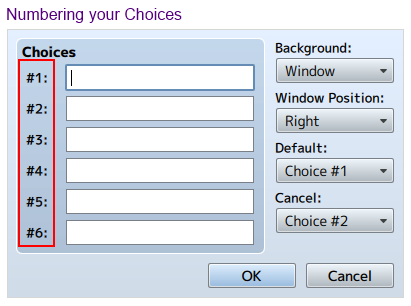 Then open your Plugin Manager (F10), double-click an empty row, and select the DisabledChoiceConditions plugin. The numbers along the left is how choices are numbered. You will use these numbers when disabling choices. Where `choiceNumber` is the number of the choice that you wish to disable. Choices are numbered based on the order that they appear in the list, starting at 1. Which set of choices do conditions apply to? 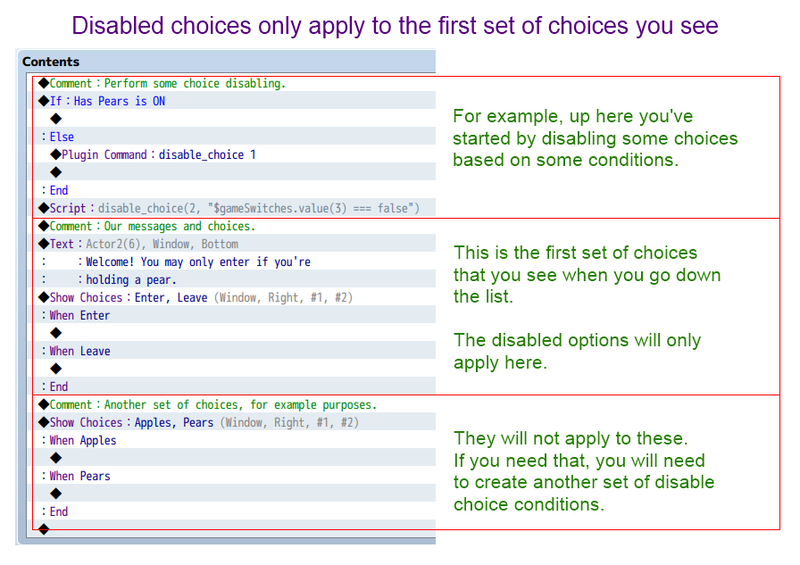 Disable conditions apply to the immediate set of choices, on the same indentation level. As a rule of thumb, you should declare all disable conditions immediately before your choices. To avoid breaking up messages and choices, you can place the disable conditions before any messages as well. Hi, just to know is it possible to disable the choice depending on item possession ? 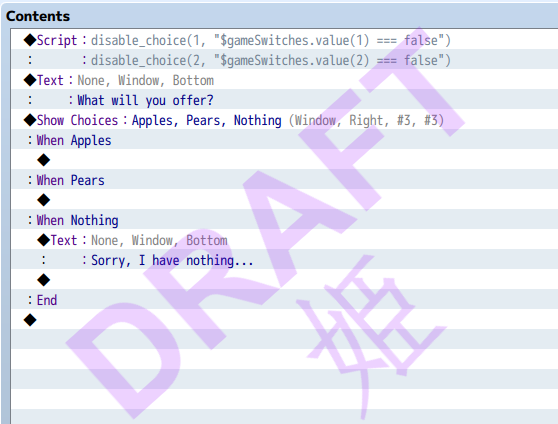 Yes, in the conditional branch event command, the 4th page has options such as “Item”, “Weapon” and “Armor”. These are used to check whether you have those items or not. 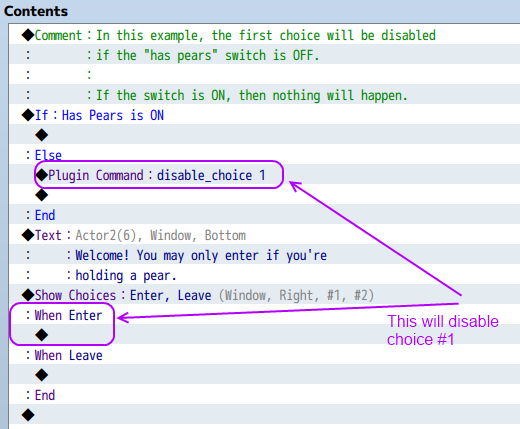 You can create a conditional branch and then just use the plugin command to disable a choice. Could you add “limit time to choice or default special choice ” option ? By “limit time” do you mean, the choice is only available for a limited time? (like a special sale). Or do you mean a “time limit” so after 10 seconds, the game will pick a default choice? My bad english. “Time limit” , System will pick default choice after some seconds. Ok, I will look at some ways to implement it. I could only find this page through youtube and not the website, I might not be looking in the right place, but thought I’d let you know! Great Plugin though! Oops, I forgot to update the MV Plugins list.